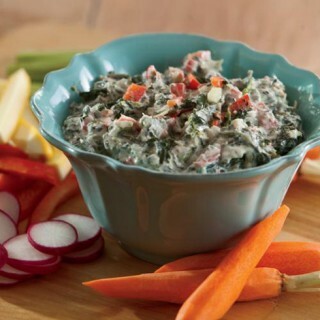 Make this quick veggie dip, featuring low-fat yogurt as a base, for tailgates, showers and parties. Nutrition Highlights: The spinach in this dip contains A, C and K, plus potassium and fiber, and the low-fat yogurt helps cut calories. In a medium bowl, combine all of the ingredients except raw veggies. Cover and refrigerate until ready to serve. Serve as a dip. Nutrition Facts (per serving): Calories – 148, Fat – 2.4g, Dietary Fiber –2.7g, Protein – 12.3g, Vitamin A – 188%, Vitamin C – 81%, Calcium – 39%, Iron – 15%. In most dips and dressings, plain yogurt can be substituted for sour cream or mayonnaise. This results in added nutrition and less fat, calories and cholesterol. If you need to make this recipe gluten free, check the ingredients in the vegetable soup mix.